With my kitchen design studio being based in the busy Delta hub of Atlanta, it has made it easy to take on projects all over the U.S. I’m very appreciative of being able to be so far-reaching with my business. However, whenever I get a call from a potential client to work on a Lowcountry home, on a stretch of South Carolina’s coastline, my heart always does a little extra flutter. I love to visit this part of our beautiful country, especially in the dead of winter when Atlanta is feeling a bit dreary…a.k.a. January. If you’ve never had the opportunity to visit the Lowcountry area, you need to go right away. The architecture alone will take your breath away, and the food will melt your soul. Nestled between Charleston and Savannah is a particularly charming community called Palmetto Bluff. I had an opportunity to work on a Lowcountry home there a few years ago. I’ve never profiled this project on my blog before, so I thought I would share it with you today. I think it perfectly captures the serene quality of Palmetto Bluff, with its soothing greens and blues, reminiscent of the coastal marshes. I think this project is particularly relevant now as people are beginning to crave a little more elegance served alongside the simplicity that has defined the last decade. So I think there’s much to hold dear about Lowcountry style, even if you’re not from these parts (written with a Southern drawl). In fact, the thing that I love most about this style for kitchens and bathrooms is that it could be adopted by just about anyone anywhere in the country. Lowcountry homes have a relaxing, almost contemplative quality about them. Nothing in the home should feel too contrived or take away from the tranquil environment. 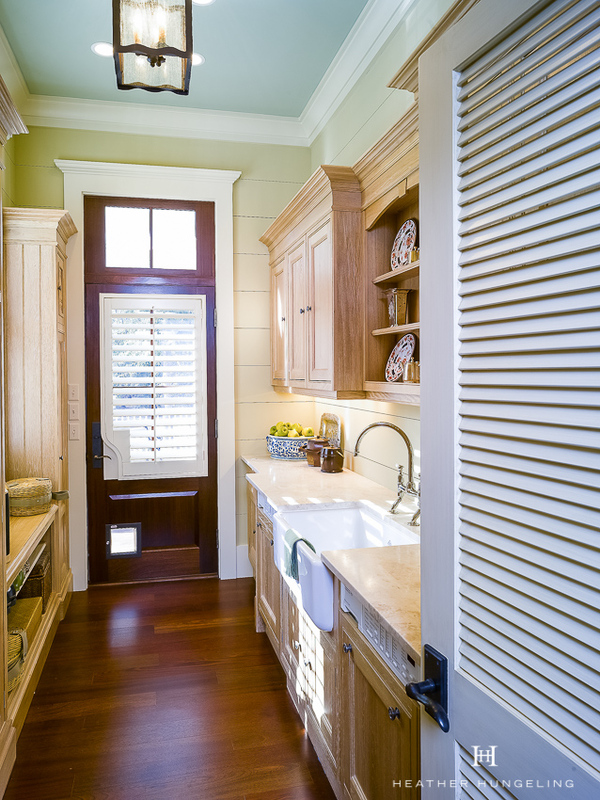 A shaker style door works well in the kitchen below while sticking with a flush-inset style of cabinetry by Clive Christian maintains a degree of elegance. Keep the moldings relatively simple as well. In the kitchen below, we used a fairly traditional hood surround to compliment the home’s historic look but we kept it simple and understated. In case you’re curious about the screen behind the range…that’s a special type of LCD television designed to be both heat and moisture resistant. A Lowcountry home should evoke a sense of history, even if it’s newly built. Yew, a cinnamon-hued wood grown in England (recognized for its usage in fine furniture, as well as antiques) imparts that nostalgic feeling to this kitchen. In addition to grounding the room in tradition, the warm wood tones are also a beautiful contrast to the cool palette of blues and greens. If you can imagine this kitchen with all-white cabinetry, you could see that it would quickly look washed out, especially up against the vibrant view of the marshes and live oaks outside the window. If you’d like to stick with painted cabinetry, you could consider using a large wood countertop on the island to provide a warm and organic element. The wood chopping blocks accenting the island are made from Iroko, a warm reddish-brown species of wood with similar characteristics to teak. Since it holds up very well around water, it is a species frequently used in the boating industry. Have you ever been curious where the term “Haint Blue” came from? South Carolina! Referring to a blue-green paint color, it was historically used for porch ceilings. The particular color was believed to keep away the “haints” or evil spirits. According to The Scout Guide, it was believed that these spirits could not cross water. The blue paint color, therefore, tricked spirits into thinking that it was water and prevented them from passing into the mortal realm and causing mischief. Since that time, Southerners have brought this tradition inside to use on interior ceilings as well. Its continued popularity in this region is no doubt also due to its cooling and calming influence. You certainly don’t need to live in the Lowcountry to incorporate this element into your kitchen or bath design. After all, “Sage Green” is set to be the hot color for the foreseeable future in the interior design world! In a warm and steamy climate, however, a refreshing and soothing palette is a necessity. Also, whenever you have a lot of intense greenery outside, the sunlight tends to project a lot of that green into your home, rendering certain colors an undesirable greenish hue. Sometimes it’s best not to fight that, and work with the palette mother nature has prescribed. I don’t know about you, but I’m completely tired of the farmhouse thing. Its charm for me was quickly obliterated by all of the Hobby Lobby nick-nacks and ugh…the word art. Yet I still have an appreciation for the use of applying wood planks to the wall. Contrary to popular belief, Joanna Gaines did not invent that - she just zealously embraced it and the whole world seemed to join her. Historical Concepts, the renowned architectural firm who designed this house, has been applying this treatment to their historical home designs for decades. It’s a more refined version of the shiplap madness and is much easier to incorporate into our homes. Look for v-groove planks or simply use wide boards with clean edges and a moderately smooth finish. As you can see in the images, we used a horizontal treatment on the walls in the kitchen, while we went vertical in the bathroom. I hope you've enjoyed this post and found some inspiration for bringing some of that warm South Carolina charm to wherever you are! Don’t forget to sign up for access to my Luxury Resource Library below, which will also keep you in the loop on future blog posts!